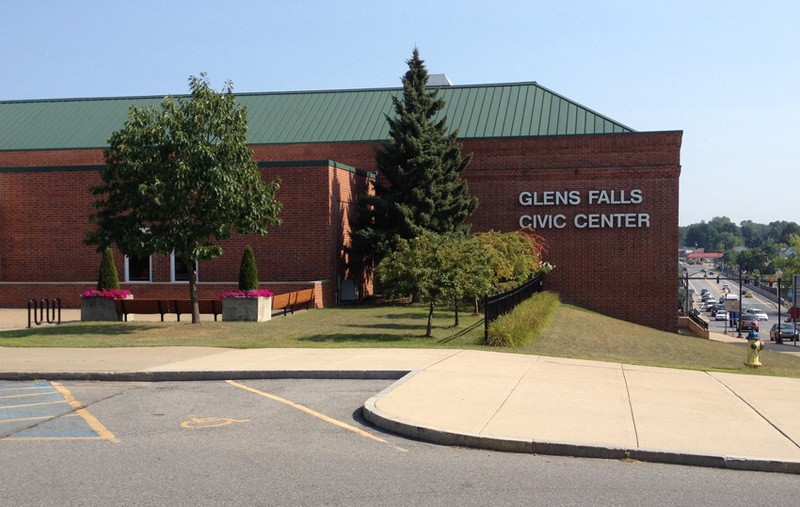 The 4,774-seat Glens Falls Civic Center was built in 1979 during the city's Urban Renewal Era, and was designed by Donald McNeice of Crandell Associates. It has hosted a wide variety of events throughout the years, including hockey games, concerts, graduation ceremonies, and more. The 15-year Urban Renewal Era was a conflict-ridden time in Glens Falls, as many historic buildings were demolished to make room for expanded parking, roadways, and businesses. Disagreements between developers and city government resulted in major construction delays, and demolished lots sat vacant for extended periods of time. One of those empty lots was located at the corner of Warren and Glen Streets. Every building on the block had been torn down in 1968-69 to make way for multiple projects that never materialized. Two years later, a developer proposed building a 40-store shopping mall on the site, but that project, too, was delayed and eventually scrapped in 1974. Five years after that, the Civic Center was born. When it opened in 1979, the Civic Center became home to the Adirondack Red Wings, the American Hockey League (AHL) affiliate of the NHL's Detroit Red Wings. The Red Wings enjoyed 20 years of success at the Civic Center, bringing home four Calder Cups as AHL champions. Since the Red Wings left in 1999, a number of other hockey teams have enjoyed residency in Glens Falls, including the UHL's IceHawks and Frostbite, the AHL's Phantoms and Flames, and the ECHL's Thunder. In 1980, the Civic Center received a visit from the Olympic torch on its way to the Opening Ceremonies in Lake Placid. Glens Falls resident and member of the 1968 Olympic bobsled team Mickey Luce carried the torch into the arena in front of a packed crowd. The next year, in 1981, the Civic Center hosted the New York State Public High School Athletic Association (NYSPHSAA) boys basketball tournament for the first time. The arena has continued to do so every year since. A number of well-known musical artists have performed at the Civic Center since it opened, including The Grateful Dead, Phish, The Who, Frank Sinatra, Boston, Matchbox Twenty, Ozzy Osbourne & Black Sabbath, and Foo Fighters. Other entertaining events at the arena have included Sesame Street Live, the Harlem Globetrotters, WWE Wrestling, and Ringling Bros. Barnum & Bailey Circus.